It’s Honey I Shrunk the Kids meets the Cold War! How awesome is that? This book was just great, y’all. I mean it. The concept is completely ridiculous, sure, but as long as you don’t take it too seriously it all comes together quite nicely. The writing was crisp and clear, the book was action-packed, everything was enjoyable. Even the cover is pretty great. I don’t know why the guy is naked. That didn’t really come up. Apart from that, though, it’s pretty accurate. A dude is small and there are ants. The ants tend to be bad news, as you might expect. I assume that coin is there for scale, just like the pencil. I have a bad head for measurements, so I’m not sure just how accurate this depiction is as compared to the size our hero is reduced to in the book. Mat is shrunk down to a quarter of an inch, so it seems to me to be about right? I can’t think of anything off the top of my head that is a quarter of an inch tall, something I could keep in mind as the narrative unfolded. My mental picture drifted somewhere between nearly microscopic (which is way too small) and about as tall as a dime (which is way too big). This is not the fault of the book, though. It was really consistent. And I like that. Unlike a lot of books, we do not start with the procedure that makes our hero, Matthew Dilke, small. It would be really easy to start off a novel with a dude who is living his life and then gets recruited into some kind of secret project and then gets shrunk down and we get to experience his early weirdness while he adjusts and all that kind of thing. I think most novels would have done it that way. This one did not. We start off with Dilke already small and running around in his garden. He’s been there for at least a little while, although we get to see a few things as new through his eyes. He’s developed his skills a bit, though, and so this is definitely an in medias res beginning. We’re thrown right into the action, and it gripped me from the start. It isn’t long before Dilke starts to get some buddies. First off is Henry Scott-Milne, who Dilke at first dismisses as a rich university kid. Henry proves his worth pretty quickly, though, when it’s revealed that he’s really good at entomology. He’s a knowledge base that really helps Mat get going. His CV even points out that his grandfather was an associate of T.H. Huxley, which at first I was like “Okay, I guess?” but then I did some soul-searching and realized that if someone came up to me and told me their grandfather hung around with Darwin’s Bulldog I’d probably immediately want to be their friend. Next up is Bill Olsen, a big game hunter that’s lived in Africa for a while. Mat specifically requested that Bill come along eventually, mainly to help develop defenses and weapons that’ll be useful to people who are a quarter-inch tall. Bill is another good guy. The three of them get along pretty great. I guess I should point out what the whole point of this shrinking thing is. You’d think, based on the title and the back-cover synopsis, that it was a program to develop tiny spies for use against the Godless Commies, but that is in fact not the case. The British Government (this book is very British, by the way) is developing a means to shrink people in an effort to combat overpopulation. Man, people in the seventies were really concerned with overpopulation. Whatever happened to that concern? It should be even more worrisome today, but honestly we never seem to hear about it anymore. The population doubles something like every forty years, which means it’s doubled since this book came out, and yet nobody seems to be as worried anymore. I guess we’ve moved on to other problems to write science fiction about. Take that, Thomas Malthus. I guess the idea makes a certain kind of sense. If people are 1/300 their original size, that means the world is 300 times larger and can hold 300 times the number of people, which is really a lot. Plus that indirectly means 300 times the resources to use, since tiny cars will use less gas and tiny factories will use less coal. Plus it opens up new types of food as well as allowing current sources of food to provide even more of it, relatively. So Mat, Henry, and Bill are a sort of forward expedition into the world of the tiny, just to see if people can adapt and survive. They do so with flying colors. They develop tiny crossbows and use things like nettles and wasp venom to kill ants and centipedes. Grasshoppers and aphids provide a whole bunch of meat for them, which they claim tastes like lobster. Everything is looking up. So yes, there’s no shrink ray involved. It’s a biological process, which actually makes less sense to me, but again, I’m willing to run with it because the rest of the book was so good. Certain details were fleshed out in thoughtful ways that I liked. One conversation on the matter of measurement sticks to mind. Our shrunken heroes are still going to think in terms of feet or yards, and that could lead to confusion. Thinking of “one yard” as a relative distance compared to oneself is a natural thing to do, but since an actual objective yard is now 300 relative yards, that could be bad. Henry does some math and figures out that, roughly, one millimeter in shrink-land is about a foot when they were still big. So we have some kind of conversion system that works for the rest of the book. Really the first part of the book is just adventure in a garden. It’s fun and it’s really quite cinematic in its presentation. I could see it happening in my mind’s eye, which for me is an accomplishment because I have a terrible visual imagination. Not too much of consequence happens, though, so it’s not really something I can summarize, other than to say that our heroes get better at what they’re doing, they learn some stuff, and they fight some ants. A guy named Charlie shows up about midway through the book. He’s a military man, some sort of officer, and he’s bringing them equipment. I should point out that there is currently no way of un-shrinking somebody. That might be the reason why Charlie immediately goes into a funk. It could also be the drugs they use to shrink people. It’s never revealed but it’s speculated upon a lot. The trio tries to help Charlie out, but he finally just gives up the ghost. It was pretty sad. It’s somewhere around the second advertising insert (“Shouldn’t your next cigarette be True?”) that some sort of plot kicks off. There are only about fifty pages left! 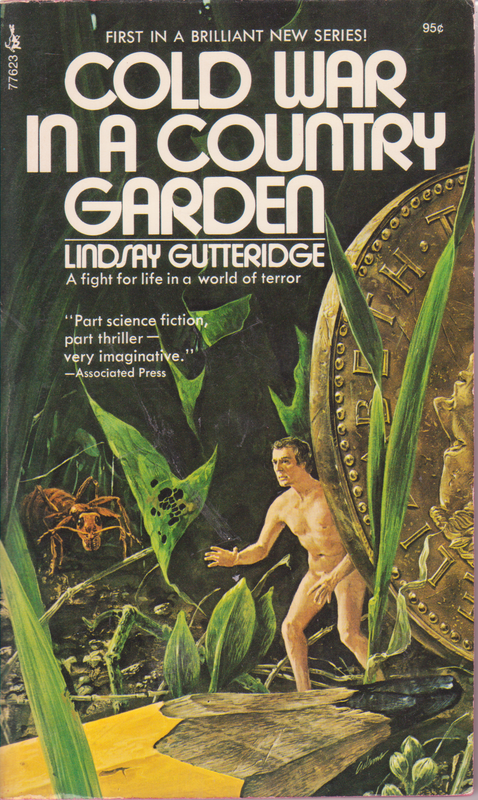 Fully two-thirds of this book is “adventure in the back yard.” I would actually have preferred it if the whole book had been that way, because the Cold War thriller part of the book was really the weakest. Mat, Henry, and Bill (such solid Western names) are dropped off in Romania (the book calls it Rumania). In fact, they’re dropped off in a cigarette box, which I thought was pretty great. Their mission is to spy on this guy named Volsk because MI5 thinks that he’s part of a plan to invade the West. Their mission is fairly simple in premise: they just need to use the fact that they’re tiny to bug the guy so that the British government can keep tabs on him. They decide to do it while he’s asleep. Things start to go wrong, though, as they’re ascending him. The party is attacked by lice. This causes Volsk to itch, so he swats the area, killing Henry instantly. Bill disappears and Mat is hurt. Mat finds himself face-to-face with, of all things, a tiny Russian! It seems the commies have been developing shrinking technology as well. Batzar, the guy he meets, seems to be somewhat insane, as the Russian shrinking method is unstable. At least that’s what’s hinted at. It could just be that Batzar was already insane. He reveals Bill’s dead body (dissected to better understand how the British shrinking technology works) and interrogates Matt. Batzar also reveals another shrunken test subject: a woman. In a bit of unfortunate old-timey racism, she’s described as a “negress.” I guess the term wasn’t quite as offensive back in 1971, or at least it wasn’t a term tinged with hatred like Lovecraft would have used it many years beforehand, because the woman is at least a person. She’s also beautiful, apparently. And terrified. She’s being experimented on to see how the shrinking process will affect her ability to reproduce. Nothing too squicky there, it’s not like they’re intentionally getting her pregnant or something (at least I don’t think they said anything like that), but Batzar does say something about removing her ovaries soon. Mat finds a way to incapacitate Batzar so he can escape and take the woman with him. She eventually reveals her name to be Hyacinthe and she studies Political Science and she’s from Uganda. They never actually do the Horizontal Hammer Time, but they grow close to one another in a more emotional way. Batzar shows up one last time with some cronies while Mat and Hyacinthe escape. This leads to probably the craziest part, but one that was decently foreshadowed. See, back in the garden, our heroes once got chased by an ant. They manage to skirt around something that looks like a large crater, but the ant decides to cut right through. It turns out to be an ant lion nest, and the ant gets its comeuppance. Well, here at the end of the book, pretty much exactly the same thing happens, except instead of an ant, it’s something like four tiny people. It’s gruesome. It’s Chekhov’s ant lion. The rest of the book is a denouement as Mat and Hyacinthe get picked up by some (full-size) agents and taken back to London. Mat fully expects to be reprimanded or something for failing the mission (they never actually bugged the guy), but it turns out that he succeeded in some other ways, like getting some pictures of the current Russian code system and learning that the commies have shrinky powers as well, so it all ends on a good note, I guess. How exactly is this shrinking supposed to work? Do our heroes have smaller cells, or fewer cells? Either way that leads to some problems. At the size our heroes are shrunk to, certain things would start to break down. How could they smell things when the particles are going to be the size of their nostrils, or, at the very smallest, larger than the nerves the nose uses to sense these things? Could their eyes be as sensitive if fewer photons are hitting the retina because it’s so small? There’s a lot I don’t know about biology (don’t know much trigonometry), and there’s even less I know about theoretical shrunken human biology, so maybe these questions are dumb but there are some genuinely good ones that I’m missing. I mentioned that there are two ad inserts in this book. Oddly enough, only one of them is for cigarettes! The other, on one side, is advertising Black Velvet Canadian Whiskey (ugh!) and the other side is advertising land for sale in New Mexico. $25 a month for 118 months can get you five acres. I think I could afford that. The back says that this book has been “bought for films by Dino De Laurentiis” and that it will be made into a movie. Google wasn’t much help in finding out whether it was actually turned into a film, so I don’t know what happened there. I’m guessing that if it were made into a film, it was with a different name, so I don’t know. I’d love to find out. Sounds like this was a good, solid adventure read by an author that, though his biology may be questionable and his use of tropes obvious, knows how to make a cracking good tale. I’ve wanted to read this for a long time. It’s so worth it! My review doesn’t really do it justice. This does sound awfully interesting. Rumania, eh? I thought they stopped spelling it that way somewhere around the Second World War. I wonder if this author was old fashioned or just old. Population growth is headed towards minimal or even negative in most places outside of Africa and parts of the Middle East: right now it’s not so much the absolute number of people which is going to be the problem (unless some 21st century idiot invents immortality or some such) as dealing with their desire for middle class American lifestyles. I rather enjoyed this when I read it many a long year ago: since it apparently holds up, might just track down a copy.